First published in Glass Craftsman, Issue No. 208, June/July 2008. In my tutorial on strip cutting, I discussed creating kilnformed glass projects using strip cutting techniques. Usually, these projects are constructed with a dam lined with fiber paper which surrounds the glass to maintain the desired final shape by restraining the glass flow during the fusing process. 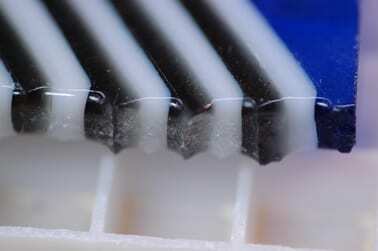 Although in some situations it is possible to end up with a smooth, acceptable, edge when using these dams – most of the time the edges of the resulting fused pieces are rough and jagged, or at very least take on the texture of the fiber damming material. In order to create a professional finished piece, some coldworking will be needed to shape, smooth, and possibly polish the edge of the project. A rough edge after firing. 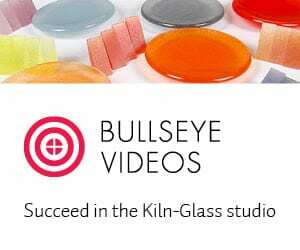 There are multiple ways to accomplish the process of smoothing and polishing the edge of the piece, and the method you chose will rely heavily on the coldworking equipment that you have available. The basic process consists of grinding the edge of the piece until it has the shape and smoothness you desire. This is done by beginning with coarse grinding material, and progressing to successively finer and finer grit size until you achieve the finish you want. As you might expect, this could be done by hand, but it is accomplished much more expediently and with much less effort with power tools. 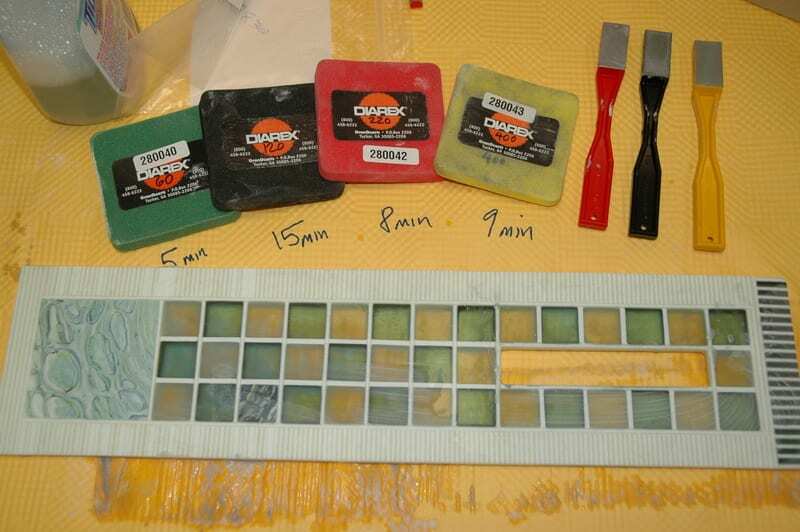 If you wanted to try this by hand, you could use diamond hand pads in grit sizes beginning with 60 grit, and then progressing to 120, 220 and 400 grit, getting a successively smoother finish with each grit. A selection of hand grinding tools. These hand pads can be purchased from various stone working and glass working supply sources. When using this method, it is best to have a spray bottle of water to keep the glass and diamond pad moist during the grinding process. Any type of grinding tool that can keep the grinder and the glass moist without danger of electrocution can be used. 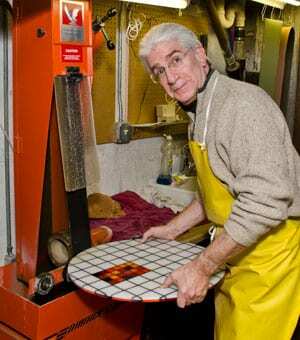 A tabletop grinder as used by most stained glass artists would work, as would a tabletop lapidary grinder, or a flat lap grinder. 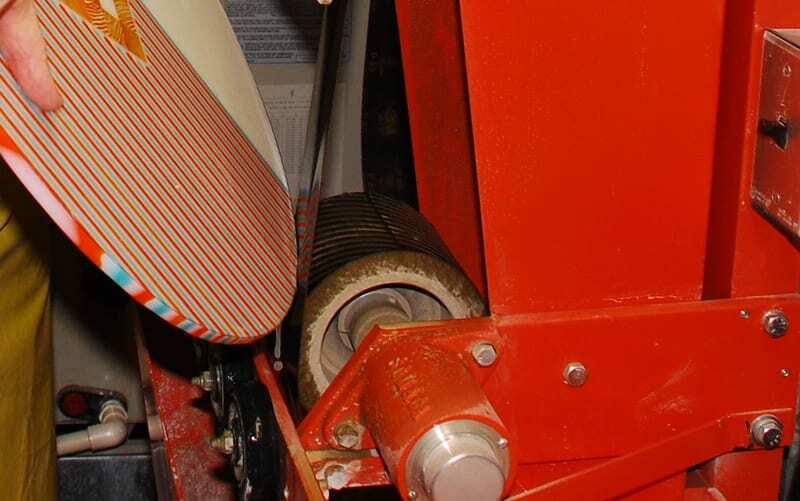 A lap grinder (which has a horizontally oriented, spinning, abrasive wheel) is the best tool for grinding straight edges, but would not be optimal for rounded projects. The wet belt sander (WBS) works well for both types of edges and is the best tool of all for this purpose. The rest of this article will be about creating a professional edge with a wet belt sander. Wet belt sanders come in two basic varieties: big and small. The smaller tabletop units, such as those available from Covington Engineering, do a very nice job; the larger floor models available from Somaca or C.R. Laurence are even better (Catalog Number: 2622300). The larger units are, as you’d expect, significantly more expensive – but they do make the job go faster and are more ergonomic. Both types of units can be purchased to run on 120V electricity, an important point for the home studio. Both types of machines require connection to water – but the tabletop units are made in such a way that they can be water fed from a small reservoir of water, rather than absolutely requiring a plumbing hookup as do the larger units. Both require some sort of drainage into a bucket on the floor, and you’ll need a location to dump the cloudy water without clogging your drains. Both machines are somewhat messy – but the water spray stays fairly close to the machine (as opposed to the huge mess a tile saw will create). The belts on the larger units have greater surface area and last proportionately longer. Personally, I used one of the table top Covington models for several years (Model No. 761) with excellent results, but eventually graduated up to a floor model WBS. Using a WBS to smooth out the edge of a round bowl. After you have acquired a WBS, the next decision is the type of belts to use. The two basic types are silicon carbide (inexpensive, short life) or diamond (very expensive, very long life). My recommendation is to start with some inexpensive silicon carbide belts to determine if you find them acceptable. If not, you can always buy diamond belts. I found that with the smaller tabletop unit I went through the 3” x 41 ½” silicon carbide belts very quickly and eventually purchased diamond belts which lasted for years. 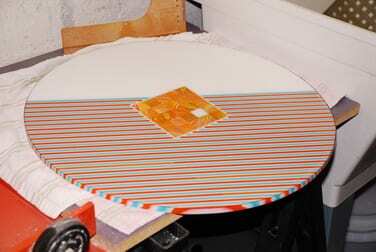 When I switched to a floor model with 4” x 106” belts I switched to silicon carbide, except I splurged for a 70 grit diamond belt to use for my initial shaping. As mentioned on the previous page, you start with a coarse grit, like 60 or 80, and progress to finer grits until you get the finished edge you want. A reasonable succession of grits would be 80-120-220-400. The coarsest grit actually removes glass and shapes the edge, while the others are used to smooth and polish. So, let’s walk though the steps of coldworking the edge of a rounded piece. In this situation, after the piece was fired, there was significant irregularity to the contour of the piece due to the method of layup. First, I make a cardboard template of the desired shape of the finished project, lay it on the glass, and draw a line with permanent marker in a contrasting color to mark the periphery. I then cover this line with some sort of wax (furniture wax, Chapstick, Carmex etc) to prevent the line from disappearing as it is washed by the water spray from the WBS. I usually mark the side of the glass that will be the most visible surface of the finished project in case the bottom side becomes scratched during the coldworking process. In this project as much as ½” of glass needs to be removed in some areas, while in others only about 1/16”. One could trim the wide areas with a tile saw (if available) to minimize time at the WBS and wear on the belts. Nonetheless, whichever way you do this, never do any grinding without having your desired edge clearly marked – or you will invariably stray from your desired shape. If your line disappears as you’re working, I’d recommend drying the project off, removing the wax, and redrawing the lines. In this project the piece was ground with the 70 grit belt first to bring the edge down to the line that had been drawn with the template. As seen in the photo below right, the glass rests on the wheels or platen, depending on your machine, and intersects the belt as it rolls over the lower wheel. As you are grinding, it is important to keep the glass moving at all times to maintain a rounded edge and avoid overheating of the piece (and possibly breaking it by thermal shock). It is also important to keep the plane of the glass consistently parallel to the floor or you will end up with a multi-planar edge. You do not have to press too hard on the glass, but rather let the abrasive on the belts do the work. After the initial shaping, this piece was progressively smoothed with 120-220 and 400 grit silicon carbide belts. The concept is that each belt should remove the deeper scratches made by the previous belt. It is hard to accurately judge the progress you’ve made on wet glass, so it is necessary to keep drying the edge of the piece in order to see how you’re doing. Keep in mind that as the belts become worn they behave like a higher grit than they began. In this case, my somewhat worn 400 grit belt gave more of a polish than would a new 400 belt. You may want to keep an older 400 grit belt to use as a final polish. 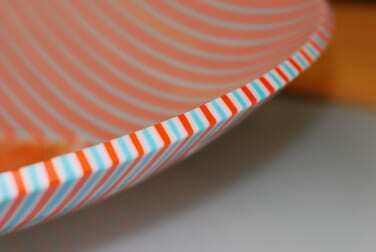 I would also recommend putting a slight bevel on the edges of the glass piece. A sharp 90 degree edge is very fragile and prone to chipping. The bevel prevents chipping from trivial trauma and the bevel actually makes the edge look more finished and smoother. Lightly pressing the edge of the glass against the belt at a 45 degree angle and rotating the glass will give a nice beveled edge. 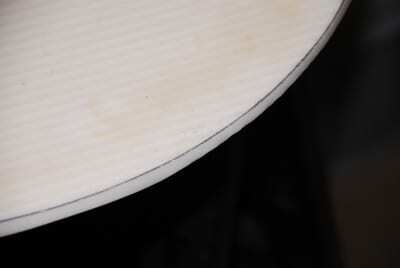 I usually use the 220 belt to put a bevel on the back edge, and 400 grit on the front edge. But, you can use a more aggressive grit for either if you want more of a bevel. At this point in the process, you have several choices, depending on the final look you want to achieve. If you want a high gloss edge, I’d recommending putting the piece back in the kiln for a firepolish at approximately 1350-1390 degrees for 10 min. The exact time and temperature you need for this is something that you will need to experiment with in your particular kiln, but you should find a time and temp combination that will slightly round the edges without much distortion, and give a beautiful polish without devitrification. I highly recommend that this be a separate next step, and that subsequent slumping be done as a third firing at a lower temperature. If your piece is round, it will stay round. But, if it is rectangular and thick, be careful with this technique – as the sides may bow out as the glass softens. 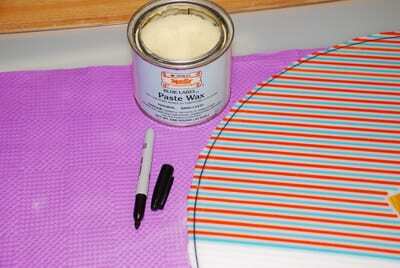 This works much better with shelf primer; Thinfire paper can leave a haze on the polished edge. If you want the edge to have a matte finish, you may want to stop polishing after 220 or 400 grit, and possibly apply a sealant, such as Armor All, Liquid Lust’er, Rain-X, or Watco Oil. Or, you can slump at this point, and if you have your temperatures figured out properly, the slump firing with seal the matte finish and look great. But, if you want more of a polish, although not with as high a gloss as you get from firepolishing, you can consider using a cork belt to get an even greater sheen. I would not recommend polishing the bevels with the cork belt, as you might strip the cork off the belt. Unfortunately, it is at this point that deeper scratches that might have previously gone unnoticed may appear. When that happens, you may want to go back to a 220 or 400 belt, and start over. 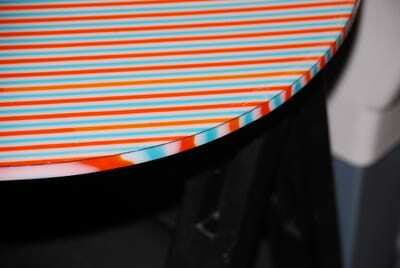 The color and pattern of the glass will dramatically affect the visibility of these scratches. A dark, solid color such as black will make these scratches the most obvious. A lighter, patterned design as in these photos is more forgiving. To obtain a true, high gloss, optical polish using only coldworking techniques requires following the cork belt polish, with cork and pumice, and subsequently felt and cerium oxide. For edges like these, those extra steps are rarely necessary, as one can get a nice polish with the steps I outlined above. Slumping is done as the last step in the process, and depending on your slump schedule may enhance the polish of your edge.